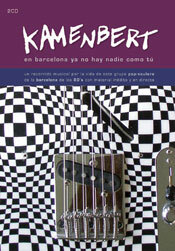 "En Barcelona ya no hay nadie como tú" (There's anybody like you in Barcelona) is the DCD with the complete recordings from the historic band Kamenbert. They were one of the groups with more unconditional fans in the 80’s, but they issued very few discs, that is the reason that has taken to Flor y Nata Records to as much elaborate this compilation of unpublished songs live and demos and as of some of his remembered successes in this double CD EN BARCELONA YA NO HAY NADIE COMO TU (IN BARCELONA ALREADY THERE IS NOBODY LIKE YOUR), title put by the own group and removed from "Tercipelo Azul” letter, that is included in the. The elaboration has been slow, we have looked for by all parts to find those forgotten recordings but also photographies that began to lose the color, hidden posters, press clips close of being devoured by waster, It has been able to rescue songs as "No me molestes" or "Hey baby" from demos made in 1982 & 1987, live covers of "Cool Jerk" or "Rescue me" recorded the old Zeleste or "Australia" in 1988 in a performance in Miranda de Ebro. The double cd, that appears in luxurious digibook also includes "Ultimo Grito" and "Tuve una novia psicodélica" of his wanted first vinyl single, the hit single "Sha la la la" from the MiniLP "Soul Nights" and its last recording, the soundtrack of the series of TV3 "Judes Xanguet i them Maniquins". Altogether 34 songs and one interactive track. History begins in Castelldefels, Barcelona, in 1981 when Dani, Robert, Xavi, Carlo and Manolo decide to express their restlessness, They define were defined itself as "children of the 80, when the city was gray and dangerous, the money and the information was scarce and the future glimpsed like the stupid idiot joke of which nobody laughed" (according to its own words). In the world the "New Wave" arose and new born KAMENBERT also they broke with the previous decade (heavy, symphonic and layetanian rock) taking like reference point rithm'n'blues and soul from the 60’s. The first 80 saw the appearance of small records companies that being inspired by the British, put in front the imagination to the economic power. Perhaps for that reason dozens of singles and EP's (in vinyl) in front of the standarizado format were published "long-play" of the 70. Immersed in this vortex, KAMENBERT had his first opportunity at the Spring of 1983 publishing the only one single from DNI label (issued by Flor y Nata Records) with a cover by comics painter Montesol. They followed multitude of performances, festivales and scenes shared with Brighton 64 (then also in Flor y Nata Records), Los Negativos, Los Novios and so many others. KAMENBERT were always a excited band and through which they got to never pass up to 15 people between musicians and vocalistas but the nobody older from 25 years. With Maika’s arrival to replace Manolo as lead voice, the turn more black. They followed the changes until the point that in 1986 only Dani was already of the original KAMENBERT. In the 87 it is Maika that leaves and the Kamenberettes (inspired by Diana Ross’ Supremes, Martha Reeves Vandellas or the Shangri-Las) takes protagonism. 1987 are also the year in which they sign by DRO and they publish the MiniLP "Soul Nights".